SUPERNATURAL Gallery: 11x01 "Out of the Darkness, Into the Fire"
Have Sam and Dean been engulfed by the Darkness? What’s going on with Castiel? And is Crowley really dead? Hints, if not direct answers, to these and more questions can be found in these first look images from Supernatural’s season 11 premiere. Airing Oct. 7, “Out of the Darkness, Into the Fire” promises to see the Winchester brothers’ relationship in a good place following Dean’s season long suffering under the effects of the mark of Cain. It’s probably just as well, as the boys are going to need every friend at their disposal, and even a few old enemies, in order to defeat their latest enemy, the pre-biblical Darkness itself. Or should we say herself? According to the latest rumors, The Mentalist alumna Emily Swallow is stepping up to take on the role of a seductive and malevolent femme fatale. Is Amara an agent of Darkness, or the spirit itself? 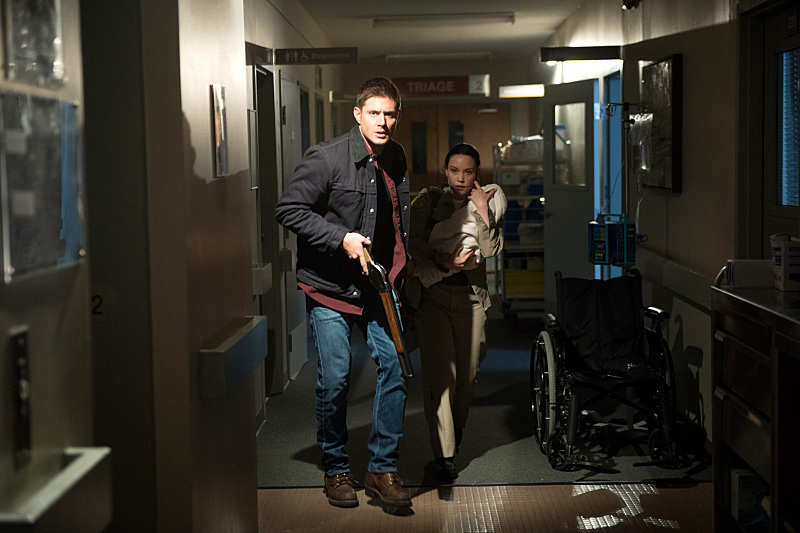 Supernatural "Out of the Darkness, Into the Fire"
Supernatural -- "Out of the Darkness, Into the Fire" -- Image SN1102B_0134.jpg -- Pictured (L-R): Jensen Ackles as Dean and Laci J. Mailey as Jenna Nickerson -- Photo: Diyah Pera/The CW -- ÃÂ© 2015 The CW Network, LLC. All Rights Reserved.